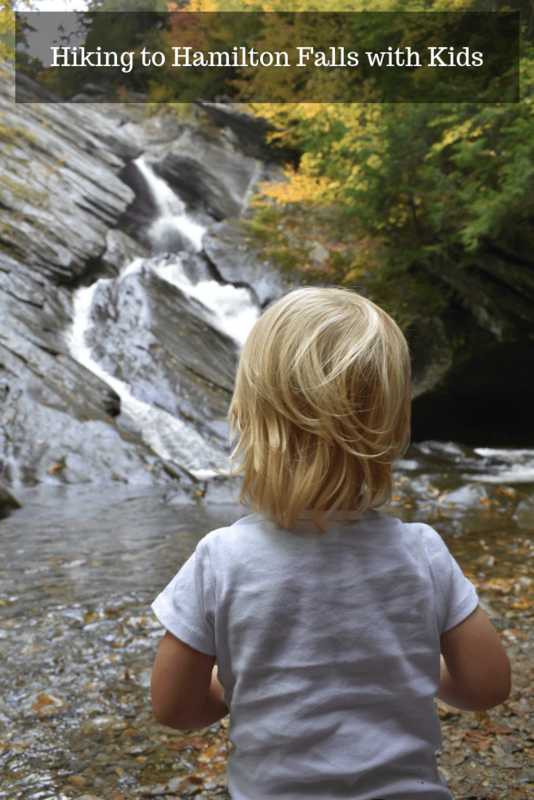 Jamaica State Park is home to one of the tallest waterfalls in Vermont, Hamilton Falls. With 41 tent/ RV sites and 18 lean-tos along the river and dappled through the woods, it is also a beautiful place to camp. You don’t have to be a camper to enjoy the park, although you may have to pay a day use fee. The trail head for Hamilton Falls is just beyond the playground. Dogs are allowed but must be leashed. It is a 3 mile hike to the falls, which took us 1.5 hours. We had 5 children with us with a wide age range so that did slow us a bit. The first 2 miles of the hike, you walk along the West River. The scenery as you wind down the river is spectacular, especially in the fall when foliage is at it’s peak. This used to be a railroad track so it is a flat, wide trail and well packed down. It is perfect for mountain bikes and you could even push a stroller if needed. The last mile as you veer up to the falls becomes quite steep and can be muddy depending on the time of year. This part was the most difficult for the little ones because they were starting to tire out. Reaching the falls is such an amazing reward. Hamilton Falls is 125 feet tall so it makes for an awe inspiring site. The kids loved it and were so proud of themselves. Refrain from swimming at the falls as many people have lost their lives there and there are many signs reminding you of what the count is up to. I think people get in trouble by thinking they can swim in the pool at the top of the falls and get swept off the rocks. Pack lots of snacks and drinks. It’s the best way to keep kids going. My kids love CLIF Zbars and they are perfect to keep in a backpack. There are a few picnic tables along the river so you will easily find a serene place to stop and have a break when they need it. Twice a year, the US Army Corp of Engineers does a controlled water release from Ball Mountain Dam which draws recreational paddlers from far and wide. It is really entertaining to watch people ride the rapids. The releases are usually around May and September (click here for schedule). Expect the park to be very busy at this time. Hamilton Falls really ranks up there as my favorite family hike. All ages and abilities can do it and the scenery just can’t be beat.